busy and have lots of appointments to attend, sometimes at short notice. If you wish to cancel an appointment, we require 48 hours notice. If we cannot fill your appointment, we may ask you to pay 50% of the appointment fee. entails that it is not possible to guarantee outcomes from any approach. You have discussed and received information which will have informed you of many good strategies. Now we discuss it further to help you formulate your approach. We will help with anything needed, information for doctors, how to get referrals, treatments abroad, sourcing supplements or equipment. 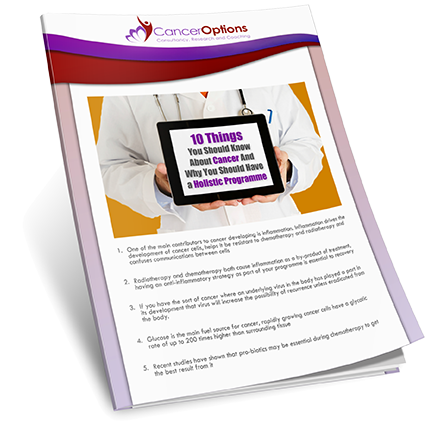 treatment options drawn from all areas of cancer healthcare. them and is not an expression of opinion on other approaches.